I blogged about our 2010 Thanksgiving celebration last year, but not until I’m sure you had all moved on to Christmas, so I’m going to post it again. It was full of inexpensive DIY details. We were fortunate to get to spend Thanksgiving with much of my side of the family in Utah, this year. Even more fortunate is that we survived our travels to and from Utah despite lots of winter weather (mountain passes and snow aren’t a great combination). 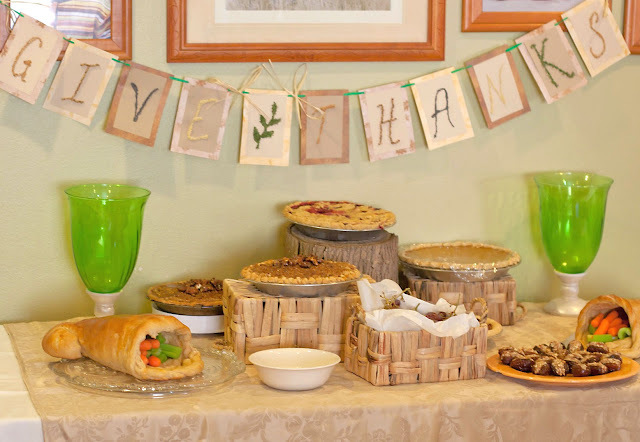 My sister, Trina, who has contributed to this blog before, hosted the meal, and joined in my insanity when it came to decorating and styling the meal. The best thing about our styling? We spent almost no money on the entire set-up! This is the appetizer/dessert table. 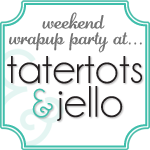 We thought it would be nice to have a few munchies on hand for the kids (and big kids), since–inevitably–it takes a while to get all of the main dishes ready at the same time. I love the banner! We got the kids in on this project and let them glue the seeds on the letters that Trina free-handed. (She did the cool leaf too!). We alternated poppy seeds, mustard seeds, parsley, coriander, and something else I am forgetting, to form the letters, much in the same way you’d apply glitter. We drew the letters with glue and then sprinkled on the seeds. The larger seed were placed more deliberately. I love how it incorporates natural things that grow–the kinds of things the pilgrims might have been grateful for. 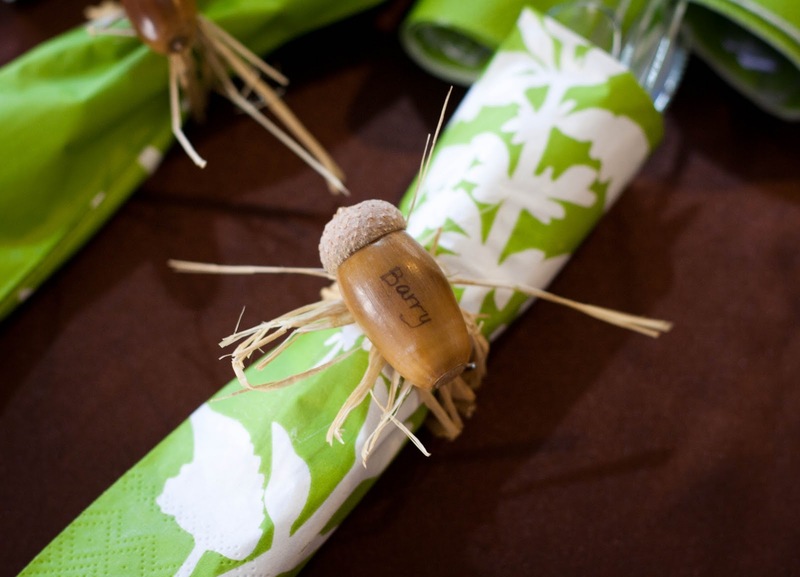 We punched holes through and threaded the paper with green raffia ribbon that Trina had on hand. All of the seeds came from her pantry, and the paper from her scrapbook stash. I had visions of covering the entire table with logs to hold the pies, but was only able to convince my husband to bring in this one appropriately-sized log from the woodpile. Trina picked up the baskets from the dollar section at Michaels. They worked well to hold things (like the grapes in front), or turned over as platforms for the various yummy pies that my sister, Serena, made. I’m not sure how I convinced my mom and Serena to make the bread cornucopias (they are both a bit more practical than I am), but I loved them, and thought they were a great place to put the crudités (grape tomatoes were added later) for the guests to munch on. I can’t remember where I first saw the bread cornucopia idea. Leave me a comment, if you know who I should credit! My mom just used her roll recipe that she was already making. They formed a cone out of aluminum foil and stuffed it with crumpled aluminum foil so it would keep it’s shape while baking. It had already been nibbled on in the above picture, but she finished off the edge of each cornucopia with a dough braid. 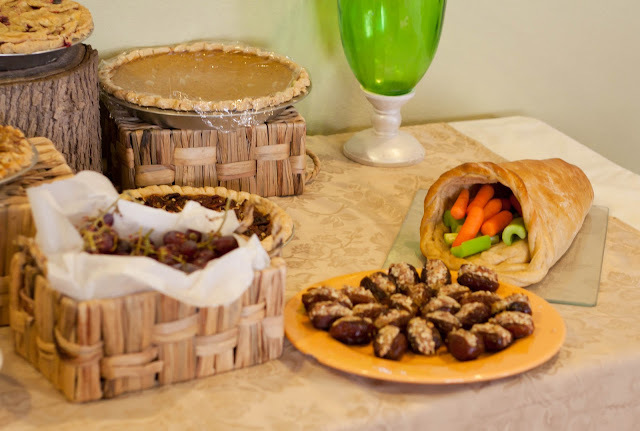 The other yummy appetizer is the stuffed date platter BSB made. They were filled with blue cheese, bacon, and shallots and were enjoyed by all of the big kids. At the table, we filled vases with grains and beans, inspired by some of the ideas Chris shared @ Celebrations at Home. I would have liked to have had more vases and more candles, but as it was, it provided a simple, FREE centerpiece. 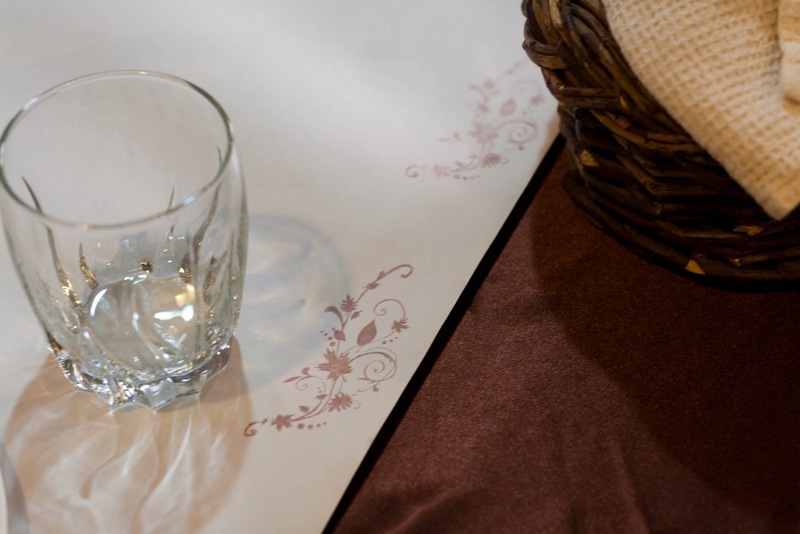 We used my brown satin tablecloths (recognize them from this event?) 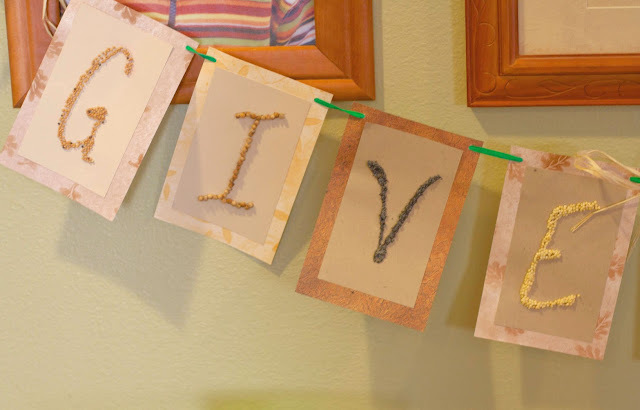 and made “table runners” out of a roll of kraft paper that Trina had on hand. 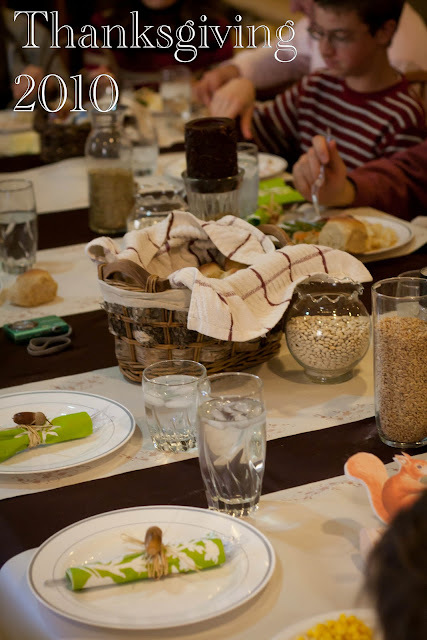 We also used the paper to cover the kids’ table and allowed them to color right on the table. We dressed up the runners by stamping this pretty leaf design along the edges in brown ink. My 9-year-old actually did most of the stamping, and did a good job. It was a nice way to bridge the gap between the fancy satin tablecloth beneath, and the casual paper runner. Trina had collected some acorns, and if the weather hadn’t been so cold, I would have loved to go back and collect armfuls more to use in our decorating! 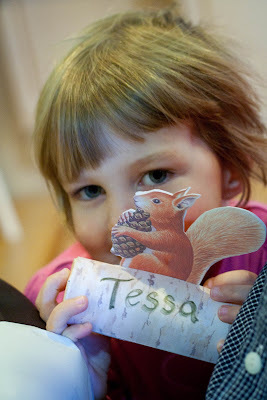 Instead, I featured the ones she had as the place cards/napkin holders. 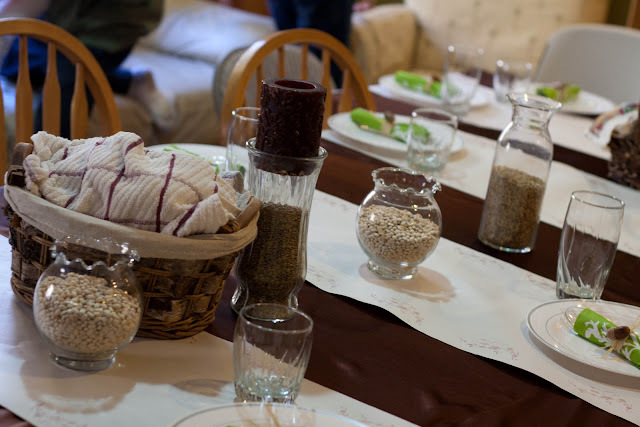 I used raffia to form casual napkin rings around the plastic utensils (I think when you are feeding more than 12, plastic is totally acceptable–especially if you dress it up!). I hot-glued the acorn cap to its base (they were all coming off), wrote names with a fine point Sharpie marker, and hot glued the acorn to the raffia. I like the splash of green from the IKEA napkins (which were left over from the fairy party). We ended up with two kid tables. One for the school-aged kids, and a tiny one for our pre-school aged munchins. I dressed up their plain white tableware with stamps. I used regular ink to stamp the brown leaf on the cup, but I used food coloring on the plate, to make sure it wouldn’t be toxic to eat off from the plates. I want to experiment more with this. I found it worked better when I mixed the coloring with a little cornstarch. But the big hit were these goody filled logs with squirrels perched on top! The printable came from Martha Stewart. Not only were these great placecards, but also a good bribe to get the kids to try all of their food before they got to see what was inside their special log. 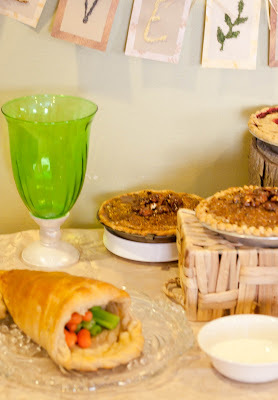 It was a lovely green, rustic and very budget-friendly Thanksgiving! Our meal this year will be much smaller, so I am dreaming up a more formal table setting. How do you make your Thanksgiving celebrations festive and affordable? Following all, what an excellent website and beneficial posts, I’ll upload inbound website link – bookmark this net website? Regards, Reader. such great and simple ideas! love the little bowls of grains and the acorn napkin rings!! Great ideas! I love those acorns! 🙂 I love how your blog looks, Kendra! The switch to WP must have gone well! Thanks, Allison! Aside from some kinks with the hosting, it has gone well! Better than all the horror stories I heard! Love this post! 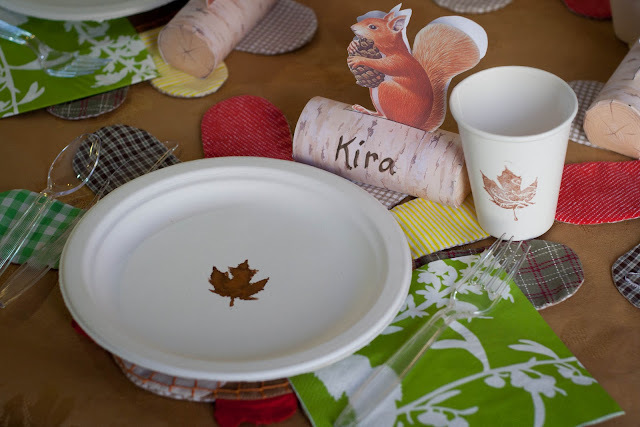 Love the napkin ring place cards, the cute cornicopia (sp?) made out of bread…everything is so cute. look when I get home. I’m amazed at how quick your blog loaded on my cell phone .. I’m not even using WIFI, just 3G .